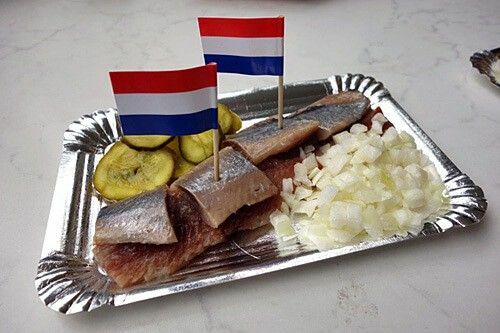 Almost all Dutch people are addicted to eating herring with freshly cut onions. And yes, the herring is raw! Join the herring festivities, known as Vlaggetjesdag, in Scheveningen celebrating the arrival of the first catch of the season. This first catch is known as Hollandse nieuwe, groene haring or maatjesharing. It is common to have herring and onions in a ‘broodje haring’, or herring sandwich. True to say it is an acquired taste, but the ultimate Dutch treat. Hollandse nieuwe, the first herring of the season, is pale-pink inside and melts on the tongue. Herring is preserved in salt and eaten raw. Preparing the fish for consumption includes a special gutting process in which the pancreas is not removed so that pancreas enzymes ripen the fish. The herring is put on layers of salt and stored in wooden barrels. This preservation method is still used but the barrels have disappeared and the fish is deep frozen. Gutting, storing and freezing is done at sea. Many years ago, before herring was deep frozen, the older the herring the saltier. Nowadays, the quality remains constant because of the freezing process. That’s why the herring sold in December is as tasty as in June. In the old days an armada of small fishing boats festooned with hundreds of little triangular flags would set out to sea on vlaggetjesdag, Flag Day. The fishermen cast their nets off Scotland and raced back to harbour. The first barrel was presented to the Head of State. Nowadays, fewer but larger boats hunt for the herring shoals. Boats are still decked out with flags to herald the new catch. The first barrel is auctioned and the money is donated to a charity. Vlaggetjesdag is the second Saturday in June and Scheveningen fishing harbour is where it all happens. The welcoming back of the fleet has developed into a (commercial) festival in which herring plays second fiddle. Join in old-fashioned Dutch children’s games, admire famous artists, watch the Royal Navy, watch spectacular demonstrations by rescue teams, enjoy displays of old crafts, watch famous chefs perform their magic, sing along with shanty choirs and enjoy the many colourful traditional costumes. Join the festivities and be sure to savour Hollandse Nieuwe, the ultimate Dutch treat and certainly an acquired taste. This salty delicacy can be eaten at any herring cart in any city in the Netherlands. Coat the herring with chopped onions, hold the fish by the tail, tilt your head and lower the entire fish into your mouth. Public Transport: Train from Amsterdam Centraal to The Hague (Den Haag) Hollands Spoor Station. Hop on tram number 11 for a twenty-minute ride to Scheveningen harbour, the final stop of the tram. How to eat herring the Dutch way.